TopEssayWriting doesn’t have a good reputation as a writing service. The writers often fail to comply with order instructions. We got a paper of very low quality, with numerous grammar and punctuation errors. There was a high percent of plagiarism, too. You don’t get a money back guarantee or discounts with this service. Many students asked us the same question: “Is TopEssayWriting.org legit?” We owe you a review of this paper writing service. 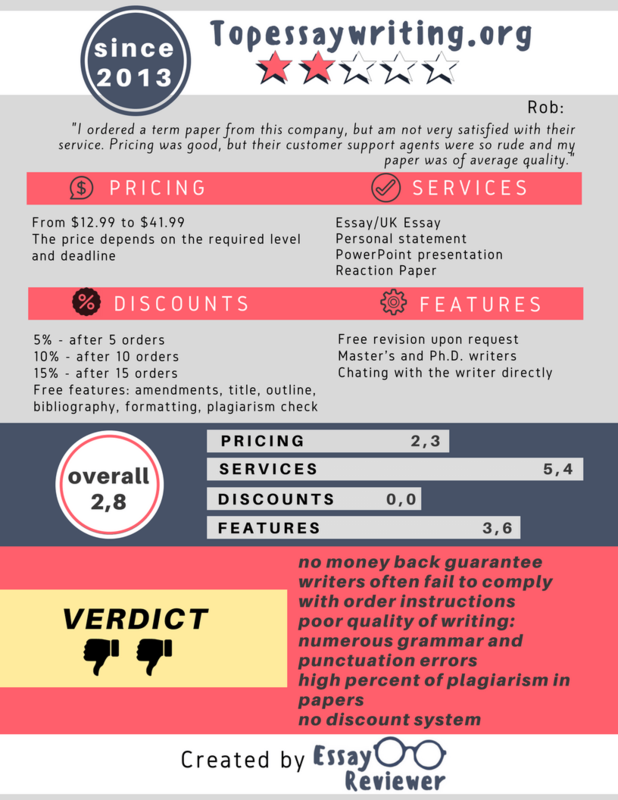 From the testimonials we managed to get, the customers of Top Essay Writing were not satisfied with the quality they were getting. They complained about high levels of plagiarism in their papers. We had to see if that was really the case, so we ordered a paper with clear instructions for the writer. You’ll find all info you need in our TopEssayWriting.org review. The offer at this website is quite limited. You may order the usual types of papers, such as essay, term paper, book report, research paper, admission essay, personal statement, article, PowerPoint presentation, and more. Editing and proofreading services are also available. So is rewriting, and that’s an offer that always makes us doubt. The prices seem reasonable at first sight. The academic levels range from High School to Doctoral. The lowest price is set for high-school level with a deadline of 14 days, and it’s $12.99 per page. For this level, the shortest deadline is 6 hours. If you want Doctoral level, the shortest deadline available will be 24 hours. That option comes with a quote of $41.99 per page. The highest price comes for Master’s level with a deadline of 8 hours, and it’s $43.99 per page. There’s a TopEssayWriting.org discount code at the website, but many visitors miss it. It’s intentionally hidden, so people would proceed to the order form and pay the full price. There’s no discount system for loyal customers. This was the highest percentage of plagiarism we’ve ever seen in a paper from a writing service. At first impression, the content seemed good. The arguments were convincing, but there were minor grammatical, spelling, and punctuation errors throughout the paper. The fact that the plagiarism detection engine revealed 48% of plagiarism was very disappointing. When you hire a paper writing service, you expect great quality. Most of all, you expect 100% plagiarism-free content that gives out the impression it’s yours. This service fails in those aspects. The writer did not follow our instructions. The option of refund was not available, so it was a waste of money. There’s a live chat option, but you have to fill in a boring form that requires your name and email before you get to talk to an agent. Then, you wait, and wait, and wait… When we finally got attended, the representative told us there was no way for us to get our money back. TopEssayWriting.org is definitely not a top essay writing service. We got a bad paper with too much plagiarism in it. The fact that there’s no money back guarantee makes this service too risky to use. The customers’ rights to high quality and unique results are not being protected. I guess what they say is true: cheap means low quality. I was attracted by affordable prices listed on their website and I regret that decision now. They’re just trying to get your attention with fantastic promises and then don’t stay true to them.